Local religious leader, Rabbi Terlinchamp, discussing the formation of the Cincinnati Sanctuary Network. Concerned about threats of mass deportations and formation of a Muslim registry under the Trump administration, leaders of several faith communities Wednesday announced formation of the Cincinnati Sanctuary Network. The Amos Project announced today that a half-dozen congregations representing Islam, Judaism and Christianity have become sanctuary sites willing to host vulnerable people in their buildings or solidarity congregations providing other support. And here is an article from the New York Times in which the work that Rabbi Miriam Terlinchamp and Temple Sholom are doing with The Amos Project is featured on the FRONT PAGE! 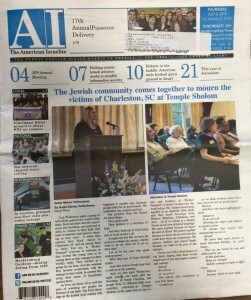 The service at Temple Sholom was also featured on the front page of THE ISRAELITE. There is a difference between Social Action and Social Justice. Both are equally meaningful but serve different ends. Social Action is meant to serve people in direct need while Social Justice are initiatives that are about changing the broken systems in our world. Temple Sholom believes both Social Action and Social Justice are essential elements to living sacred Jewish lives. These are some, but not all, of the places in which we are engaged in helping to make a difference in our world. We collect un-used children’s clothing for the Jewish community in Odessa. In the winter we engage in a congregation-wide crotchet/knitting project to create blankets and hats to send to their community as well. Netanya is our sister city in Israel. Through the guidance of The Jewish Federation of Cincinnati we are able to send needed financial contributions in order to support our sister city. Making a difference through changing the narratives that we tell and helping change the broken systems in our world. In our community we value inclusion as one of our most central tenets. We strive to be sensitive to different expressions of faith, race, economics, sexual and gender identity. We understand that people come to us from all different parts of the world and stages of life, some are changing names, pronouns, relationship status, and grappling with major life events. To all of you, we say we see you; you are welcome, safe, and included in our space.